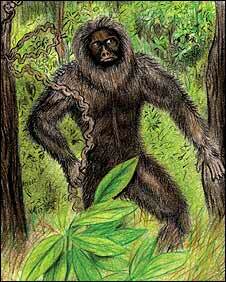 June 2008 -- In the US it's known as bigfoot, in Canada as sasquatch, in Brazil as mapinguary, in Australia as a yowie, in Indonesia as sajarang gigi and, most famously of all, in Nepal as a yeti. The little known Indian version of this legendary ape-like creature is called mande barung - or forest man - and is reputed to live in the remote West Garo hills of the north-eastern state of Meghalaya. I was invited by passionate yeti believer Dipu Marak to travel throughout the area to hear for myself what he says is compelling evidence of the existence of a black and grey ape-like animal which stands about 3m (nearly 10ft) tall. There have been repeated reports of sightings over many years by different witnesses in the West, South and East Garo hills. Mr Marak estimates the creature weighs about 300kg (660lb) and is herbivorous, surviving on fruit, roots and tree bark. The Garo hills comprise more than 8,000sq.km of some of the thickest jungle in India. And as I soon discovered, there is no shortage of people who say they have seen the creature at first hand. Take woodcutter Nelbison Sangma, for example, who works on the fringes of the Nokrek national park in the Garo hills. In November 2003, he says that he saw a yeti three days in a row. He took me from his village to the spot where he says he made the sighting, a five-hour walk in intense tropical heat from his house. "I saw the creature quite clearly on the other side of the river. It was breaking branches off trees and eating the sap. Its strength was amazing. "Obviously I wanted to photograph it, but I knew that if I left the area, it would take at least 10 hours or more to get a camera as I do not own one. By that time the creature would have disappeared." Mr Sangma says that he told the state forestry department of his sighting, but they did not believe him. He took me to the spot where he says the yeti destroyed a tree - an exhausting uphill walk through thick jungle infested with blood-sucking leeches. Mr Sangma showed me where the creature broke the tree's branches and clearly visible scratch marks on its bark. A 10-hour drive away from Nokrek is the other national park of the Garo hills, Balpakram, which lies amid thick jungle on the border with Bangladesh. It is an extremely remote area, where the hum of insects clicking in the undergrowth sounds like a series of disconnected power cables. Balpakram is famous for its vast jungle-filled canyon which spans several miles and is surrounded by spectacular cliffs. Any descent is a treacherous exercise. If ever there was terrain where a peace-loving yeti could live its life undisturbed by human interference, then this has surely got to be it. Perhaps the most famous reported sighting was in April 2002, when forestry officer James Marak was among a team of 14 officials carrying out a census of tigers in Balpakram when they saw what they thought was a yeti. According to the author and environmentalist Llewellyn Marak, such stories cannot be dismissed out hand. "I saw the footprints for myself last year," he said, and they cannot easily be explained away. "The prints were different from other animals - and were almost human in appearance - apart from the fact that they were about 18 inches [46cm] long. "Both my father and grandfather also saw the creature at different times. Each said that it resembled a large gorilla." Mr Marak argues that the Meghalayan forestry department has not seriously investigated the sightings because they are "uninterested and too lazy". The western side of the state of the Meghalaya is predominantly made up of Garo tribespeople. They are traditionally a matrilineal community, where property is inherited through the female line. They are also a community where stories and fables are deeply ingrained culturally, which is why senior politicians and officials are reluctant to discount openly tales of a yeti roaming about. Meghalaya's Divisional Forestry Officer Shri PR Marak denies suggestions that his officers have not properly investigated alleged yeti sightings - which he argues is an expensive exercise in thick jungle only accessible by foot. He uses diplomatic language when discussing whether yetis exist in the state. "I have gone to see the evidence for myself and have even taken a plaster cast of one of the footprints," he says. "As you know the presence of such a creature is an important part of our culture - passed down to us by our parents and grandparents. "But we have no concrete evidence it exists, and there may even be a possibility that some of the evidence has been manipulated to create a stir. "Because the area where it is believed to live is thick jungle, it will be very difficult to know the truth." But Dipu Marak has voluminous correspondence from various eyewitnesses to support his contention that there is something out there. To critics who say he has no photographs of this mysterious creature, he insists that "absence of evidence is not evidence of absence". "We have so many reports of sightings that I sincerely believe there is some sort of huge creature in the Garo hills," he said. "This is not just a fairy tale, nor is it an effort to woo tourists. It's deeply embedded in our folklore and scientifically it is possible too. "While I cannot prove conclusively that this creature definitely exists, nobody can say conclusively that it does not exist either." Such is the impenetrability and extent of jungle in the Garo hills that the legend of mande barung looks likely to live on in the foreseeable future. "The truth is out there somewhere," says Dipu Marak sincerely. "But like the Loch Ness monster this creature is obviously not fond of giving too many photo opportunities."